The Google Map form field allows us to place a map on the form with point marked on it. There is a limit however, to 3 such form fields per process. Coordinates – Enter the latitude and longitude divided by a “#” sign. Address – Enter the address of where you want the mark to be placed. 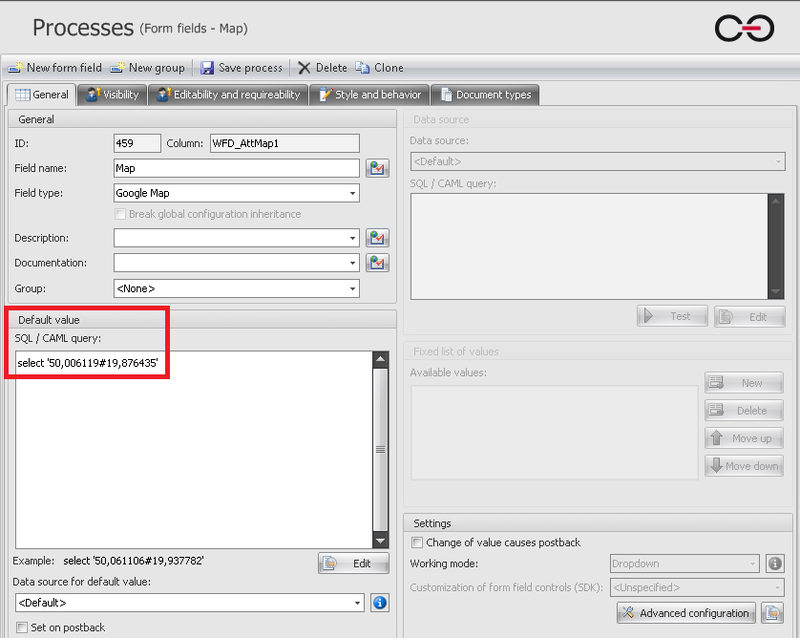 Address (dynamic) – Use an SQL query, which will return an address, which will be marked on the map. Fig.3. An example of using an SQL query in the advanced configuration. In the Advanced configuration screen we can also set which map view we want (ex. Satellite view), as well as the height of the field on the form. The width adjusts automatically.